The Winner of the ‘I’ve hit 300,000 Pageviews Giveaway’. And The Winner of the ‘I’ve hit 300,000 Pageviews Giveaway’ is…Janice Hines! Every entry in the giveaway was assigned a number. 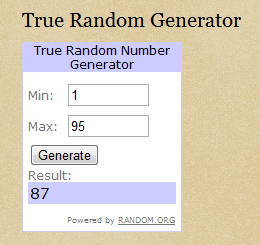 A number was chosen using the True Random Generator, and the matching entry belonged to Janice. Janice, please email me at LifeImitatesDoodles[at]gmail.com with your mailing information. You can also use Flickrmail (molossus, molossus, who says Life Imitates Doodles). You have until 12:30 PST on Oct 3rd to contact me. I want to thank every one that entered. The number of entries (95) was highly gratifying. I wish I could have given a prize to you all! When I win the multi-state lottery of several billion dollars, I promise I will, lol!